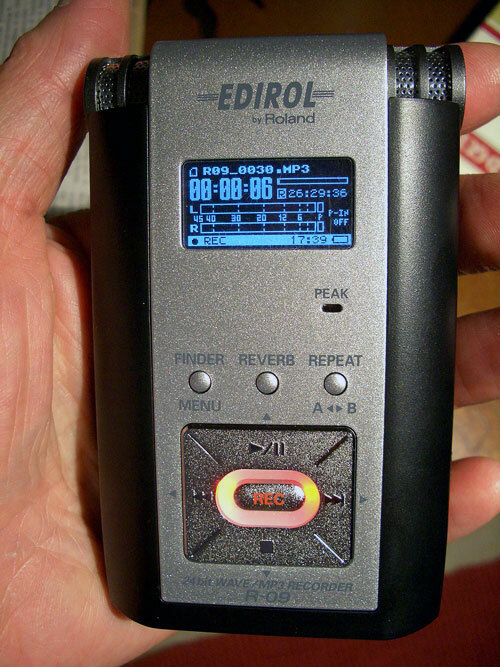 The Edirol R-09 portable recorder from Roland Corporation is almost perfect, and well worth its $400 price tag. Features and audio quality are impressive, with a little room for improvement discussed below. R-09 has few competitors in this product category. During the next few years, MyMac.com predicts it will set the standard against which other portable recorders are judged, until a unit comes along with improved interface, better port access, and a lower price. Until then, if you are serious about audio-on-the-go, take a look and listen to R-09. Roland is a full-service pro audio business. When you visit R-09’s website you can obtain or learn about useful support documents, software downloads, and dedicated accessories. Watch the demo videos and take the interactive tour! Web content on the product’s general information, features, and specification is too extensive to reprint. Here are a few essential attributes: great audio quality, full control over WAV or MP3 format/file size, lightweight and inconspicuous, enormous SD card capacity, thrifty AA battery usage, and versatile in/out ports. R-09 doesn’t impress upon initial glance and squeeze. Its looks are a little retro, or slightly Art Deco, but mostly utilitarian. You mutter to yourself, “Four hundred bucks for that?” and your skeptical self challenges R-09 to deliver the goods. Never fear, friends. You’ll soon be won over. Insert AA batteries and SD card, depress the almost-invisible POWER button on R-09’s left side, press twice the red REC button lower front center, and begin recording: voice, music, traffic, nature, neighbors, professors, younameit! R-09’s built-in top-corner stereo microphone delivers brilliant clarity and volume when the audio source is nearby or loud, but you’ll need a high-quality external microphone to record distant or quiet sound. Under most circumstances, within one to six feet, native audio input is amazing. As you double the distance from the built-in mic, input falloff is gradual, but not fatal. Quality remains good throughout the distance factor, so that an experienced sound editor can perform miracles just as a Photoshop expert can turn a questionable image into a viable one. Several musical examples in WAV format arrive on the included 64MB SD storage card. Listen to them, then delete them, and keep this card for emergencies. Buy a high-capacity multi-GB card or two, and you’ll lose them before you ever fill them. I typically record at MP3/192kbps, with roughly one MB used per minute, and my recordings are stellar. 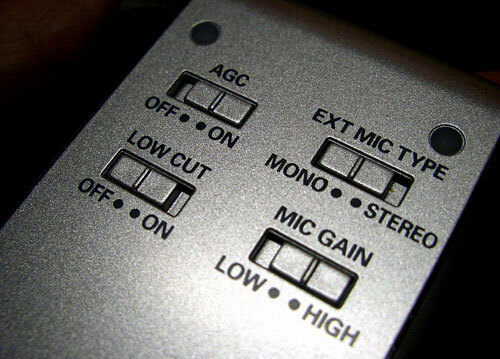 Front, back, top, left, and right surfaces of R-09 contain its many controls, for: power, input level, DC in, optical/headphone out, volume +/-, hold off/on, external mic, line in, auto gain control off/on, external mic type mono/stereo, low cut off/on, mic gain low/high, peak, finder/menu, reverb, repeat a<->b, play/pause, skip right/left, record, stop, and LED display. A sliding trap door on the bottom provides access to 2-AA battery compartment, SD card slot, and mini-USB port. Cables are provided for AC power usage and USB data transfer. No case is included. Important: R-09’s spring-snap bottom port access door is difficult to open or shut, and appears to be fragile. After 1,001 openings/closings, will it still be intact? Spending so much time with iPods leaves me thinking that Roland used a “design by committee” approach to many of this recorder’s features. I can learn to live with its quirks, but the bottom port door does not inspire confidence. The small LED display has tiny indicators for current recording and time stamp data, with additional options available by pressing the Finder/Menu button. Apple’s interface design squad was not consulted about LED presentation. At first, you think it’s barely adequate, but gradually you learn to live with it, especially when you don’t want a glaring, bright display to show the world you’re recording a live event, perhaps on the sly. All controls and buttons on our evaluation unit are black on black or silver or silver, making then difficult to see in a dark location, but rather unobtrusive. You’ll need to memorize the where and what for R-09’s most common buttons, and cover the display with electrical tape for top-secret recording situations. Red or white models are also available, but probably won’t be huge sellers. Transfer your R-09 audio files to computer easily using the included cable or an external SD card reader. The SD card’s disk icon appears on your Mac desktop almost instantly. Place the MP3 or WAV files wherever you can easily locate them. I am using Fission by Rogue Amoeba Software to edit my tracks. It’s great software. Beginning with Leopard Night last October 26, I recorded many different near and far audio tracks with R-09’s built-in mic, and included the most interesting ones at or near the ends of MyMac.com Podcasts 151, 155, 156, 158, and 159. Hearing is believing: in a car, at a concert, in a crowded retail store, at a holiday party jam session, and several more improbable locations. I did dozens of test recordings, and results were consistent: built-in mic works GREAT when in proximity to an audio source, and less great when at a distance. MyMac.com used R-09 as our primary location podcast segment recorder at San Francisco’s Macworld, in January, 2008. Please listen to our Macworld Expo podcasts. They are very good, especially numbers 166 and 167. You’ll be impressed with the audio quality of this exceptional portable recorder.